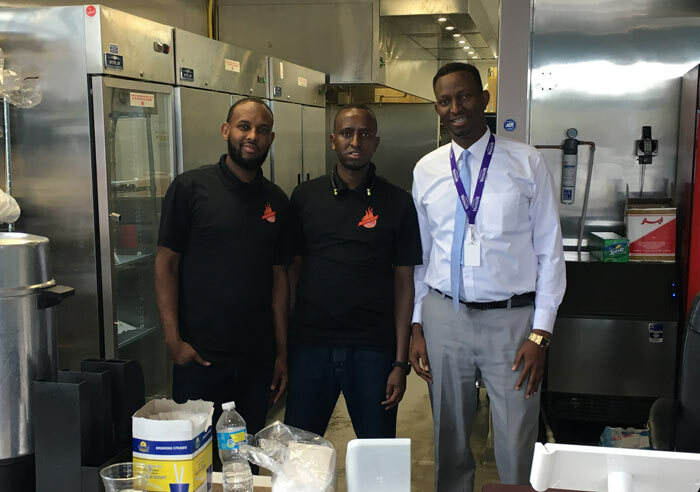 Ibrahim Hussein (right) and other Sunrise Grill (Owatonna) employees. In late July the Somali American Cultural Society of Owatonna (SACSO), was vandalized with spray paint and had a fire lit in front of its building. I was saddened by this senseless act of vandalism against SASCO which has been a reliable and valued Southern Minnesota Initiative Foundation (SMIF) grantee and client. Several years ago, SASCO was founded by Ibrahim Hussein to serve the job search needs of Owatonna-area Somali refugees, as well as provide after-school homework assistance to Somali children. Let me tell you more about Ibrahim Hussein. As I mentioned above, Hussein started SACSO to help students with homework and other Somali residents with various cultural barriers. Hussein also supports the Veterans Association in Owatonna and is a member of the local Human Rights Commission. On behalf of a SMIF nomination, Ibrahim Hussein was selected for a 2012 Virginia McKnight Binger Award for Human Service by The McKnight Foundation. In 2016, he followed his entrepreneurial spirit and helped to open Sunrise Grill in Owatonna, a restaurant that now employs three people. Accordingly, in addition to the grant from SMIF to help start SACSO, as a new business entrepreneur, he was eligible to become a SMIF Prosperity Initiative client. Hussein received help putting together a business plan for Sunrise Grill from his Prosperity Initiative coach. The Prosperity Initiative was launched in 2015 to create an entrepreneurial ecosystem for minority entrepreneurs in SMIF’s 20-county region. The Prosperity Initiative was funded by a 2-year grant from the Minnesota Department of Employment and Economic Development (DEED), and was launched by SMIF because we know that our region’s demographics are changing. From 2000-2015, the number of people of color in SMIF’s region doubled from 45,561 to 90,179 (Minnesota Compass). In addition, a 2015 Kauffman Foundation report found that 28.5% of new entrepreneurs in the U.S. were immigrants. With Minnesota’s aging demographics, if our region’s small towns want to thrive, we will need new entrepreneurs, including the highly-entrepreneurial immigrant populations. While immigrants have proven themselves to be hard-working and entrepreneurial across our region, from communities like St. James to Winona, and Faribault to Austin, they often face more barriers to success. In fall 2015, the Organizational Effectiveness Research Group at Minnesota State University, Mankato survey of immigrant entrepreneurs indicated that 91% of respondents would “benefit from additional resources to help their company grow and develop,” while 68% felt “a lack of support and mentorship to help them move their business to the next level.” Other barriers include a lack of access to alternative financing, systems disadvantages (i.e. : credit history), lack of community support and resources, and cultural and language barriers. To address these needs, SMIF is now recruiting for a second cohort of Prosperity Initiative clients with grants from The McKnight Foundation and Profinium. Ten more minority businesses will be selected for one-on-one business coaching and peer networking. Email Pam Bishop (pamb@smifoundation.org) for more information. Inclusiveness in our communities and in our economies is a goal of the Prosperity Initiative. Other ways to reach out and support our region’s growing minority population are thoughtfully addressed by Kim Schaufenbuel, Executive Director of United Way of Steele County in her recent op-ed.